These GIRLS' PULSE TEAM SHORT are anything but typical. Lined with moisture-wicking polyester, these volleyball shorts pull sweat away from your body to keep you cool and dry. The covered elastic waistband and inside draw cord ensure comfort and flexibility – necessary features for every type of athlete. These shorts provide the perfect amount of coverage with a 4-inch inseam and inner brief. Produced with 100% polyester material, these versatile running shorts are lightweight and durable. Our GIRLS' PULSE TEAM SHORT work for you and transfer from court to concrete seamlessly. Wear these volleyball shorts during a tournament or for an early morning run. 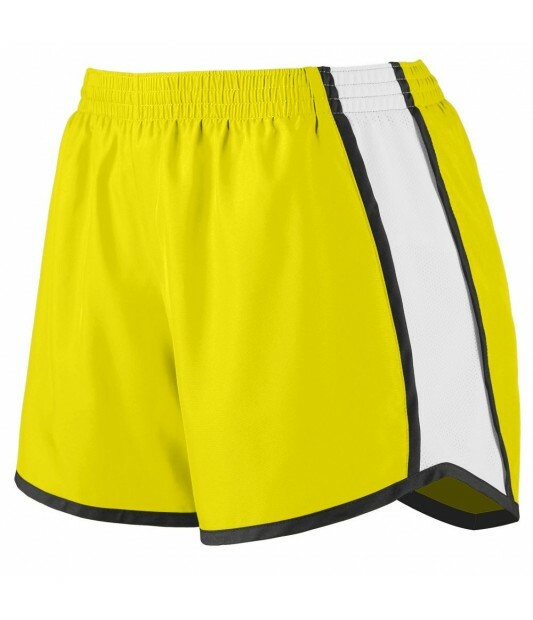 Whether you’re looking for comfy volleyball shorts or durable running shorts, you can customize our shorts to fit your style. Our GIRLS' PULSE TEAM SHORT are available in 12 color combinations, so you can play hard and look great at the same time! Girls running shorts. Also available in Women's sizes. Girls' PULSE TEAM SHORT is rated 4.5 out of 5 by 2. Rated 4 out of 5 by Poms Coach from Very cute! These are great for poms and cheer camps. However they DO run a bit bigger than the sizing chart would suggest. If in doubt and between sizes, do down to the smaller one. Rated 5 out of 5 by Rebe from Great !!!! Nice materials Perfect size. Order medium (10-12) for my 11 year old daughter and fits perfect.